Welcome to our CTMH Stamp of the Month Blog Hop! 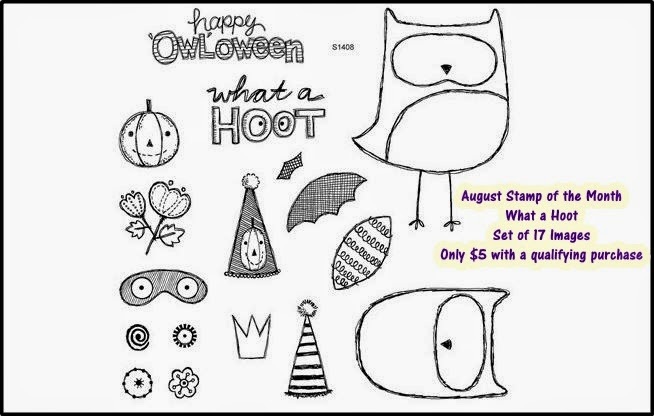 We will be featuring August's SOTM, which is called What a Hoot, a set of 17 stamps featuring the most adorable owls! If you have come here from BETH'S BLOG, you are on the right path! The blog hop is a great big circle, so you can start here and work your way all around. If you get lost along the way, you’ll find the complete list of participating consultants HERE. This month we have 67 Close To My Heart Consultants sharing their creations using this month's SOTM and other great CTMH products (with lots of sneak peeks of the new catalog goodies going live tomorrow I'm sure). Hopping is simple to do - just click on the link at the end of the post on each blog to move to the next one! Here we go! This month I'm sharing the first two of six pages (yes, MMC gals, these are your pages) done with the new Pathfinding Kit that I'll be sharing over the course of this weekend. I've been playing a lot with paper piecing the owls from this stamp set for cards, and I knew I needed to incorporate these cuties into my pages for sure. For this little guy I colored his main coat with one of our new ShinHan markers in Turquoise Blue. They color so smoothly and evenly! I pieced his little belly out of the Pathfinding paper, and his eye area is covered with the new Lagoon Hearts washi tape. Ah, washi! Can you ever really have too much washi? I couldn't resist popping on some wiggly eyes...I really think they make his outfit! For my second little dude I reversed the paper piecing, coloring his eye area and piecing his coat from the Pathfinding paper. The simple shape of this owl is really conducive to easy paper piecing. Plus since our stamps are clear, it's easy to line up the patterned paper to put the cutest bits into the area you are piecing. Now "Hop" on over to CARLA'S BLOG to see her work! Be sure to visit all the Consultants at their Blogs to get some great crafting ideas and other fun ideas! Remember, this What a Hoot SOTM is only available until the end of August! Contact your CTMH Consultant (or click here) to get your stamp set for just $5! Wow! Great job, as always! Love your pieced owls. Wendy this is just stupendous. Love it. Wow, you knocked this out of the park!!! Love it all! Your owls make me smile! No surprise, but I love what you've done! Gorgeous! I especially love the sentiment and how you did it. I also love how you used multiple patterned papers to layer the owls. What a fabulous layout! I love how you did the THANKFUL quote. Wonderful layout Wendy!! Love your sentiment too! This is a very cute layout! I love all the paper piecing and the use of the washi tape! LOVE!!! Did you also distress the edges of the cardstock bases...or it it the photo? They look so cool in your photos!!! Definitely a "copier" for me!!! I did, Katy - I just ran my chocolate pad over the cardstock flat against the page in a buffing motion. What a great layout! I love all the little details. They make a big impact!